Hours after one Queen finished a damp party on The Mall, another Queen was starting one down on the Solent. Despite forming 46 years ago, Queen — the band — were making their UK festival debut as the final headliners of the Isle of Wight Festival. Of course, it’s not really Queen. It’s guitarist Brian May and drummer Roger Taylor. 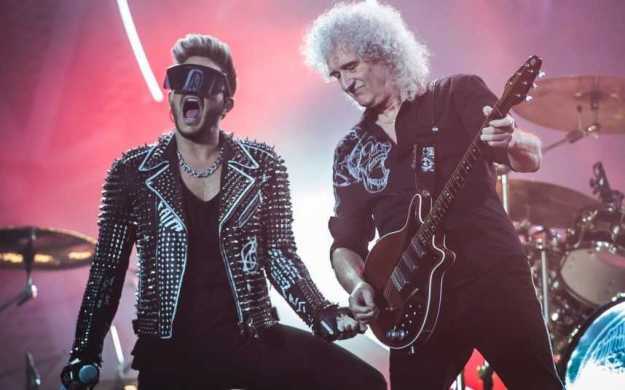 With Freddie Mercury dead for 25 years, singing duties were carried out by former American Idol runner-up Adam Lambert, now a successful solo artist in his own right. There were therefore two ways to look at this show. On the one hand, it was occasionally like very good karaoke. With Lambert in a series of bonkers outfits, it was at times more like watching Queen’s West End musical We Will Rock You than seeing the Live Aid-slaying, Wembley Stadium-filling Queen of the mid 1980s. You half expected an interval and perhaps a nice chat with some Spanish students over for the summer to improve their English. On the other hand, Freddie’s dead and this was the closest we will ever get to seeing the band in their pomp. It was this second view that won the evening. The sheer quality and enduring appeal of the songs trounced all cynicism. And in Lambert they have a charismatic and unique frontman who, to his credit, acknowledged early on that there is only one Freddie Mercury (“You’re all thinking it,” he said). There wasn’t really a song that couldn’t be labelled classic. You were reminded of Queen’s scope: the metal of Stone Cold Crazy, the disco of Another One Bites The Dust, and the pure pop of I Want To Break Free. And then there were the anomalies. Don’t Stop Me Now is a Queen song that was once derided but has grown in popularity over the years. Youngsters in the crowd lapped it up, shouting every word. Roger Taylor — supplemented on drums by his son Rufus Tiger — sang vocals on A Kind of Magic. He made a good fist of it but it was clear why he’s a drummer. Lambert dedicated Who Wants To Live Forever? to those killed in Orlando. Mercury appeared on screen twice: once to duet with May on Love Of My Life, and again to sing the second verse of Bohemian Rhapsody (“I don’t want to die”). Credit must be given to the band for not over-egging things. The balance was tasteful. After a finale of We Will Rock You and We Are The Champions, gold confetti burst over the crowd to the National Anthem, which closes every Queen show. I bet they didn’t get that on The Mall.